Address: Budapest, Pest side, 5th distr. Vaci utca, in the pedestrian street in the hearth of Budapest, nearest to the Danube. Living space: 44 m2. + 12 m2. gallery. Rooms: 1 room with gallery + kitchen and bathroom. Amenities: Nicely equipped (electric italian coffee machine, microwave, refrigerator, cooker, vessels, plates, cutlery) Bathroom fully renovated with wc, tub and shower, 30" sat tv (hotbird) 1000 channels, dvd-divx player home-theatre and washing machine. 1 king-size bed (in the gallery) and 1 sofa double-bed. Bed sheets, towels would be provided for you. Free maps and weekly cleaning are included. Location: The apartment is in the Vaci street, the pedestrian street in the hearth of Budapest, nearest the historic Main Market, popular coffee shops and characteristic restaurants. 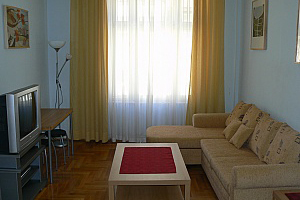 Five minutes by walk to the Gellert bath, nearest to the Danube and Liberty bridge. Is the strategic position for visit the biggest city without taxi and public transportation. The underground station is 500 meters by walk. -Public transportation: Ferihegy International Airport: Reptér (Airport) bus to Köbánya-Kispest -> Metro3 (blue line) to Kálvin tér -> walk 500 meters.